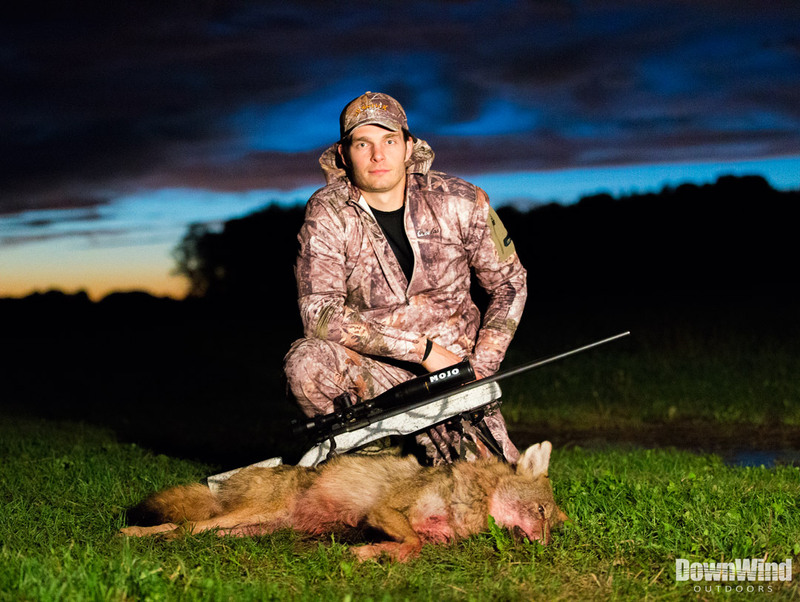 A: We primarily hunt with 22-250’s which are fast, flat shooting and leave minimal pelt damage on impact. When a setup or the shot will likely occur in close range or in cover we will bring a shotgun. We also like using .223 Remington and the .220 Swift. 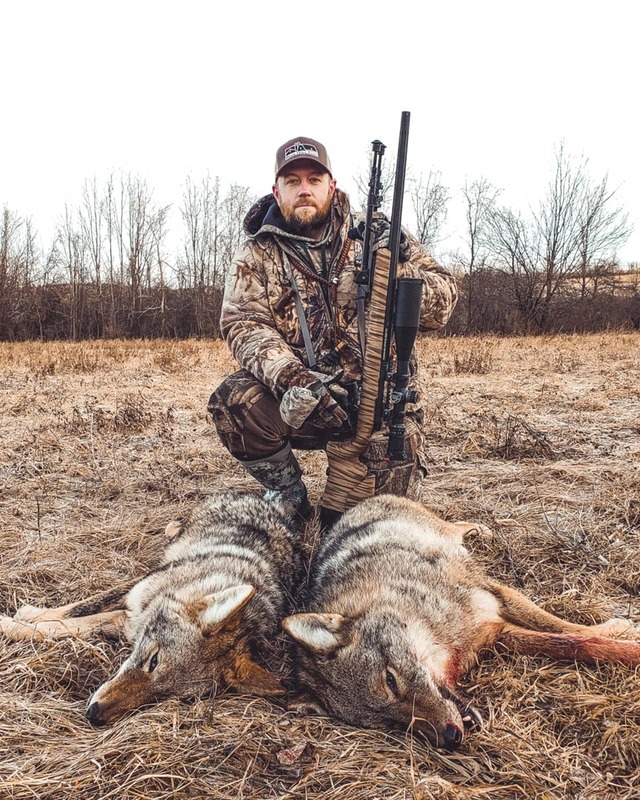 Check out our article, .22-250 vs .223 on a comparison of the two most common predator hunting calibers. Q: What type of optics do you use on your guns? 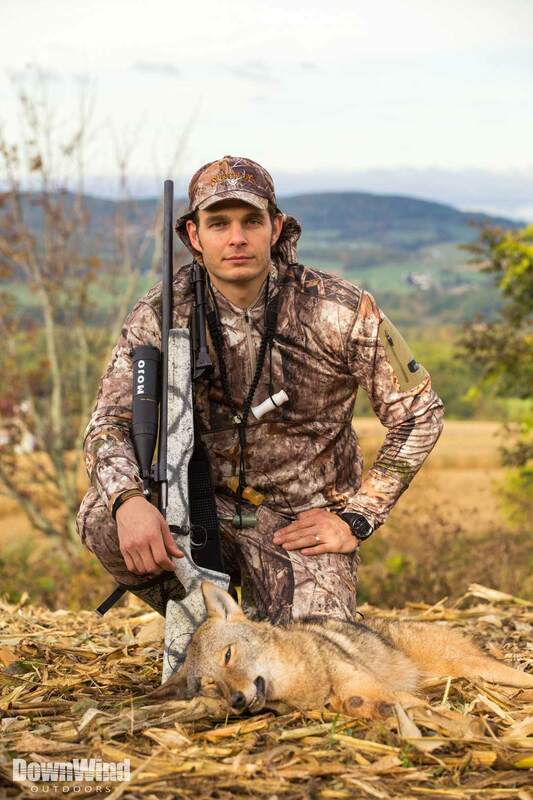 A: A good optic is very important for a successful hunt. We use a wide range of optics on our hunting rifles. A mix of Nikon, Leupold, and NightForce brands are used. Most of the optics we use have a large range of magnification and larger objectives. The range of magnification allows for close proximity shots as well as long distance shots. The larger objective gives us the advantage by allowing more light to enter the optic during low light situations. 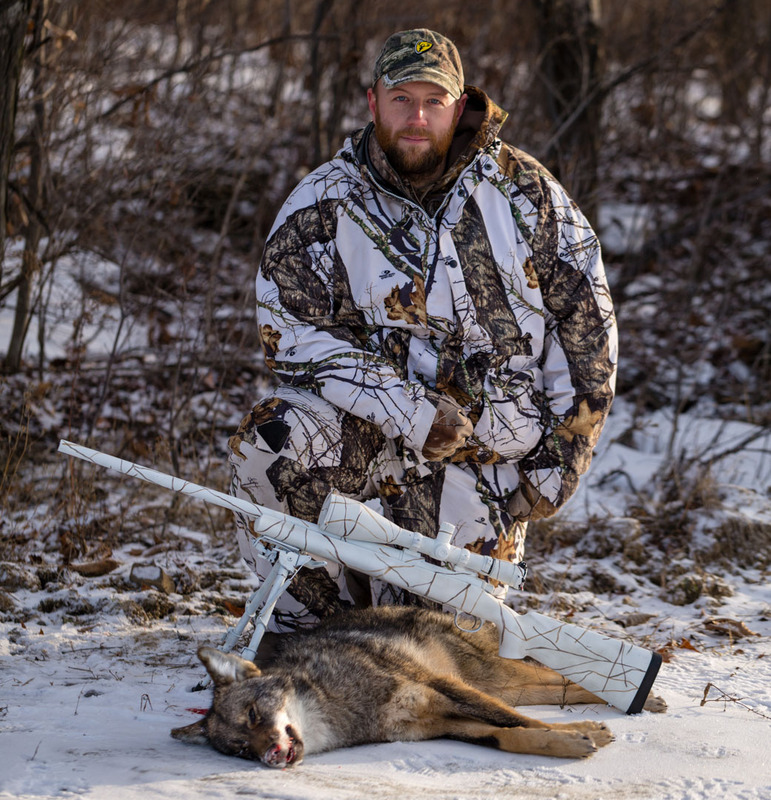 Check out our article, Choosing the Best Coyote Hunting Scope for help with this topic. Q: What type of bipods do you use? A: Mainly we use one brand which is Harris. Harris manufactures many different types of bipods, but we specifically use Ultralight model with 13.5 to 27 inch pivoting head. We have found this range of height is perfect when in the seated position. The pivoting action is crucial to a level sight plane and minor adjustments to make the perfect shot. Q: What type of ammunition do you use? A: We hand load for every rifle we own and the bullets we load are all highly frangible to limit pelt damage. For example we love the performance of Nosler’s Varmageddon round. Q: What type of calls do you use? 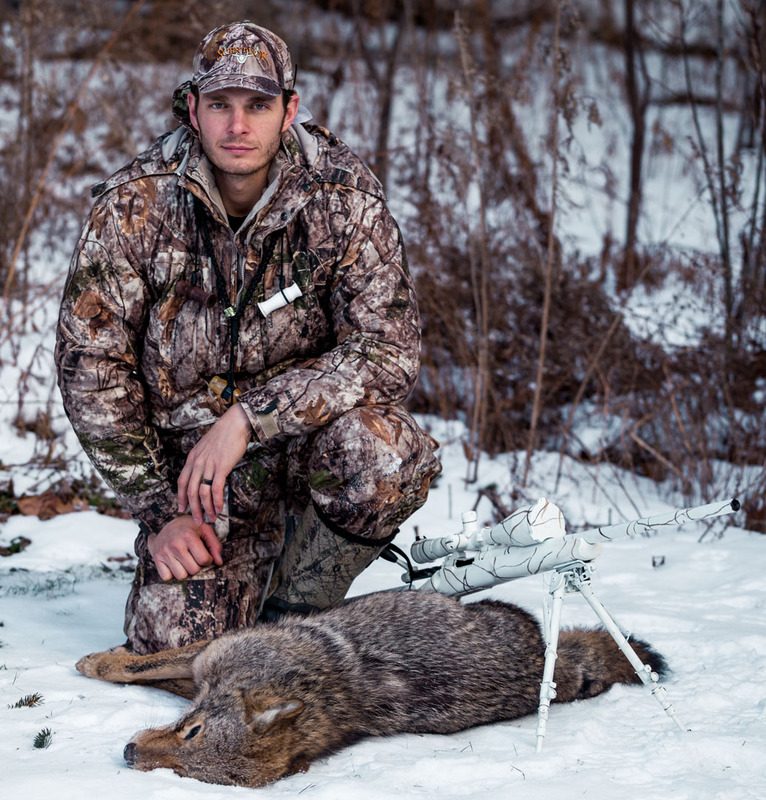 Q: What series of calls do you prefer when calling coyotes? 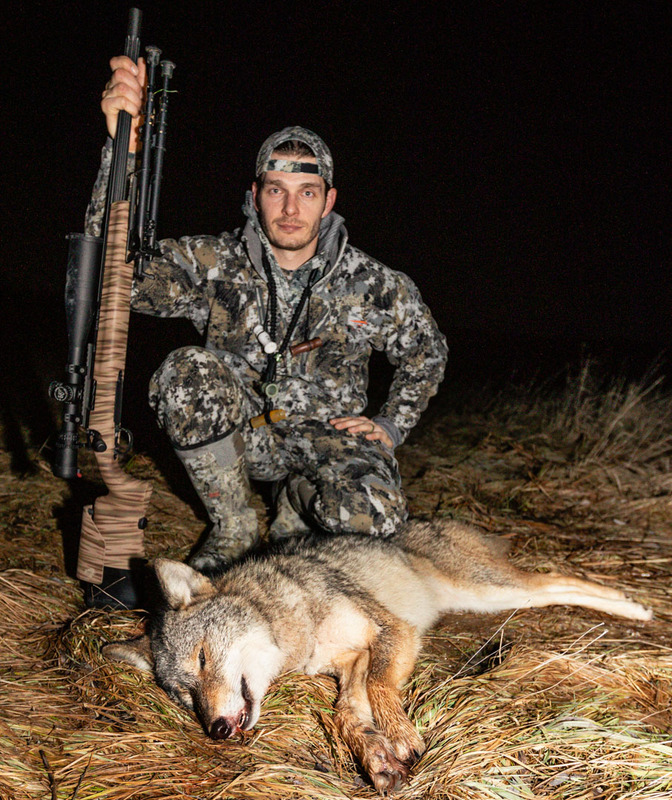 A: When starting out a coyote calling set we like to start off fairly soft on a distress call for the first few minutes as you never know how close to your initial calling location a weary predator could already be; from the next series on call loudly with every ounce of your soul. You should feel the need to catch your breath at the end of a 2 minute session! Q: How long do you do each call and how long do you pause? A: A typical calling session is very random, which we feel improves its effectiveness. However, on average we probably call for 1.5 to 2 mins with a minute pause in between. As the set progresses in length the pauses tend to grow a little longer, sometimes reaching 3 to 4 minutes of quiet time in between calling. Q: How long will you wait on a set before you give up and try elsewhere? A: We will give most sets at least 25 to 30 minutes (although it usually happens within the first 10) and if it looks extra good or we just have a “feeling” we may even stay 45 minutes or longer. 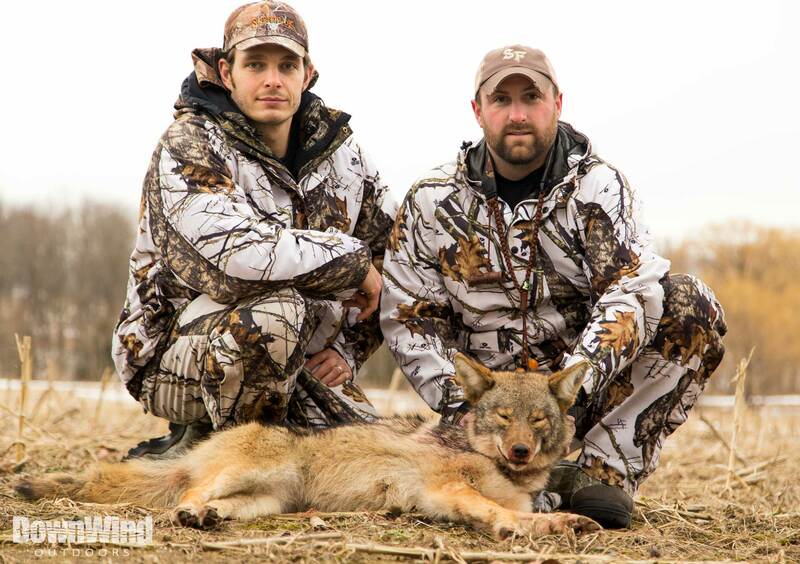 Q: What are the best times to hunt coyotes? A: We hunt the first and last light of the day which to us are referred to as “primetime”. In the morning we will do 2 to 3 sets. Mid morning to midday predators tend to wind down bed or den up till the evening. The evening set we will get to the location early and give time for the area to “cool down”. We normally start calling in the afternoon anywhere from 20-40 minutes before dark for preferred video quality. On occasion we do night sets which have a high rate of success because that’s normally when predators are on the prowl. Please observe your local/state/federal hunting regulations because they vary and some may not allow night hunting. Q: How early do you go out in the morning? A: We like to get out to the spot in the dark of the morning giving us time to pick a spot and set up. We have to leave time for decoy and camera setup as well as additional time to let the area “cool off” before we start calling. When we have a camera on set we wait till there is barely enough light to run the cameras before calling, however with no camera, you can start calling as soon as you can see through your sights/scope. Please observe your local/state/federal hunting regulations because they vary. 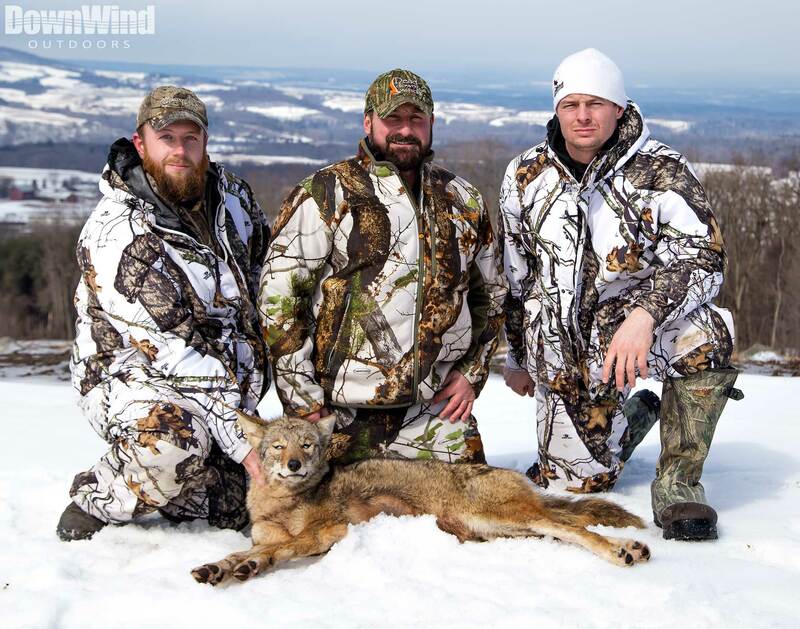 Q: Where are the best locations to hunt predators? A: We have found that you can hunt predators just about anywhere. Access is important when you are hunting predators. Farms are normally great spots to get predator action. Farms are rich in wildlife, vegetation, cropland and normally easy to gain access to. They give you a variety of cover types and almost always contain open areas good for setups. Here in the east, during low light situations predators are more liable to present a shot in open areas but as daylight becomes more prevalent they tend to hunt in thicker brush lots or woods. 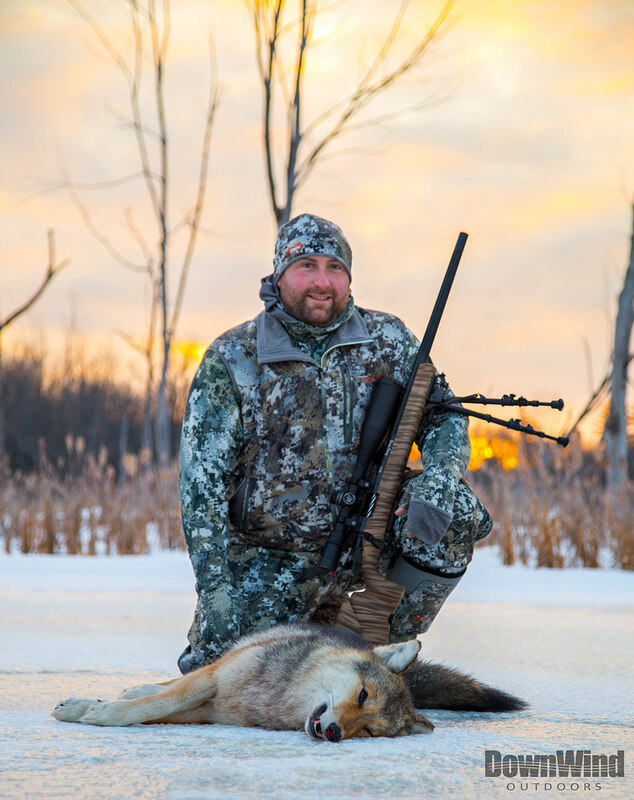 Q: What is the most important thing about coyote hunting? Q: What are effective ways to use the wind to your advantage? A: We usually prefer a wind direction that is either in your face or crosswind. When possible we prefer calling the crosswind. We feel like it makes an incoming dog a little more comfortable coming to a call rather than a wind straight at it’s back. A crosswind will give the hunter a better opportunity to get a coyote close and present a shot out front or circling the downwind side. Q: What are important things to remember when you are playing the wind? A: Be cognizant of the downwind direction and anticipate an approaching coyote wanting to circle downwind of your call. 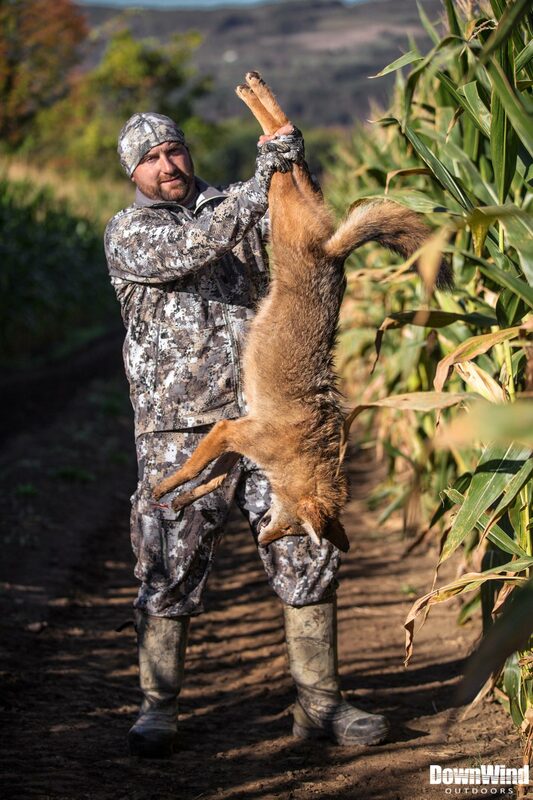 Also make note, when calling a crosswind, try not to have a thick, wooded or brushy area to the downwind side or any area where a coyote could end up catching your scent without you ever seeing him. 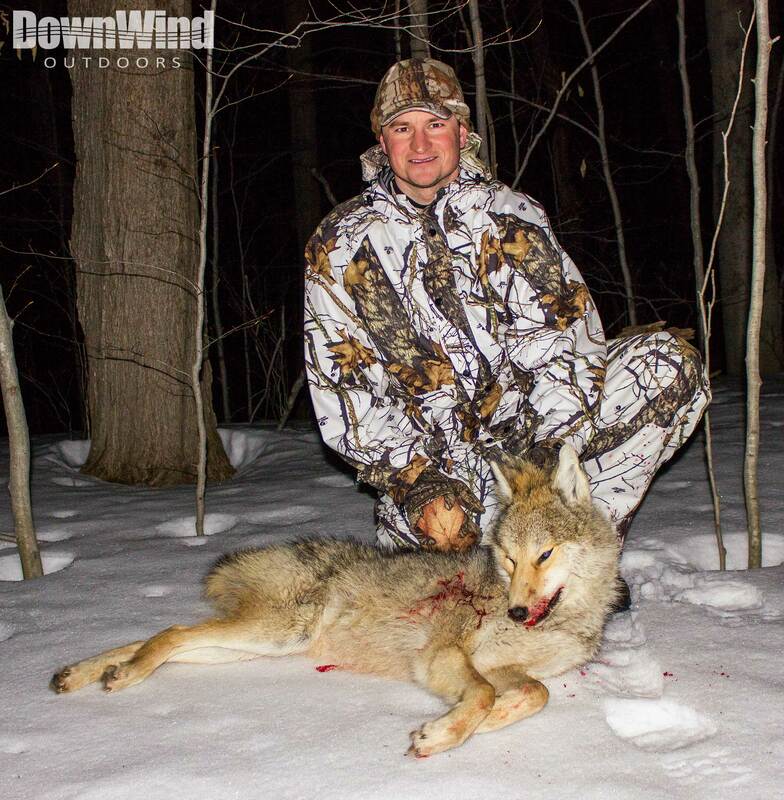 Q: What is the best way to get access to land for hunting? 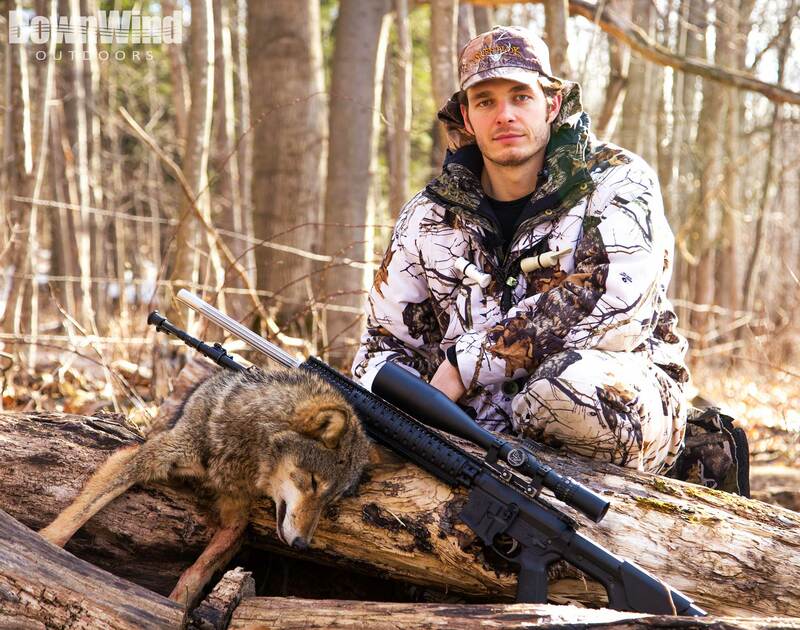 A: There are many ways to gain access to land for predator hunting. Start by asking permission from family, friends, or neighbors. This can be done by simply knocking on the door and politely asking for permission to hunt. If these options are limited, you may want to try going to farmers and other local landowners. Most of the time farmers are very easy going and willing to allow predator hunters. Asking around or stopping into your local hunting store can be good ways to get your foot in the door for access. If all of these options fail, normally states have land that is open to the public and allow access for hunting. Use any internet tools to find these locations. Q: What kind of video cameras do you use? A: We have a combination of cameras, including Sony HDR-AX200 and the Sony HDR-FX1000 as our main cameras, Canon HF G20, Sony HDR-CX500V, Sony HDR-CX580 as live second angle cameras, and various other GoPro cameras. We also use Canon DSLR with a multitude of different lenses for post hunt interviews and stills. Q: What do you do with the pelts? 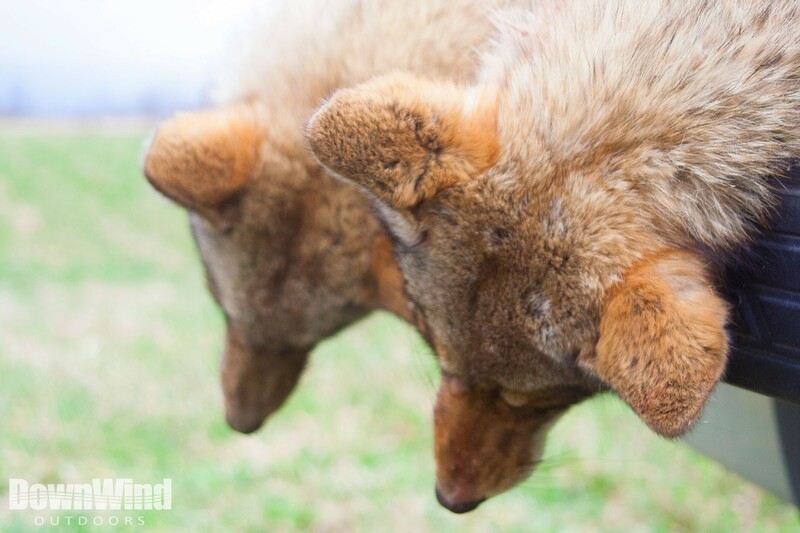 A: A great way to remember a hunt is having a beautiful tanned fur to show off to friends and family. For the most part we clean and ship our furs to be tanned, keeping them as trophies or giving them as gifts in various forms (slippers, hats, etc). Q: Where do you send your furs to be tanned? A: If we want to save ourselves the effort and send out a non-fleshed skin, we will use USA Foxx. If we take the time to flesh them ourselves, we sometimes may use Moyle and Mink Tannery. Pennsylvania hunter here. 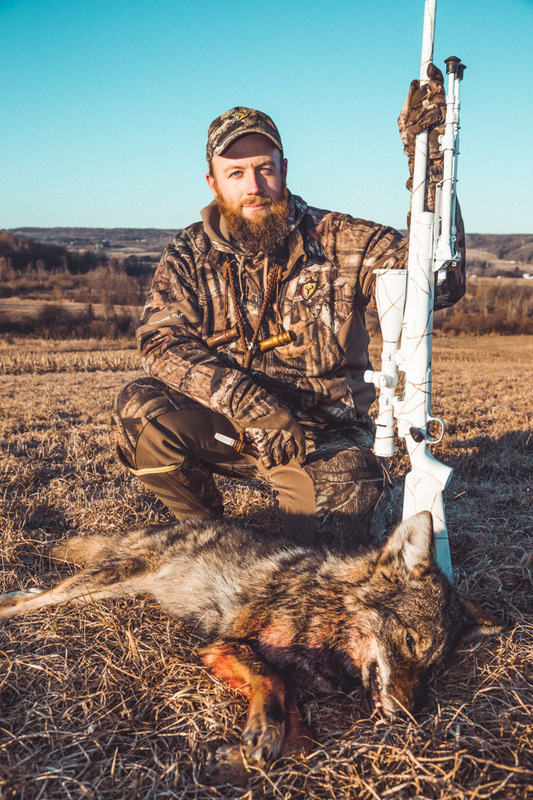 I prefer your input over anything else out there since you’re our brother state and eastern coyote hunting is totally different than the west and midwest. 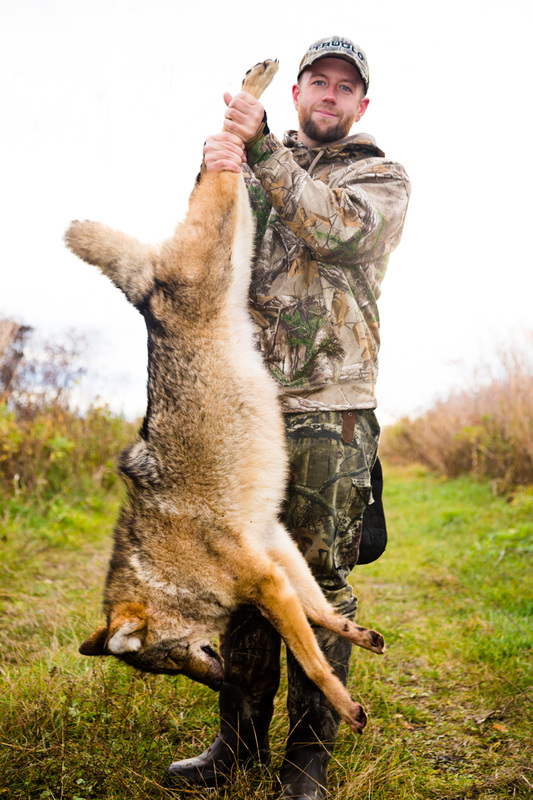 What series of calls do you prefer when calling coyotes? How long do you do each call and how long do you pause? How long will you wait on a set before you give up and try elsewhere? Do you call for bobcats ever? If so, how do you go about calling them? Thanks for the input! We added our answers to your questions above.